Like the Ninja themselves, this Ninja Recon Tanto Knife from Fantasy Master holds secrets you won't suspect until it's too late. I mean that in a good way -- the ninjas have some of the best toys. If you're not opposed to having a good time with sharp objects, this knife will be fun. The knife itself, 10-3/4 inches of matte black high carbon stainless steel with a 5-7/8-inch tanto style blade, isn't anything special. Expect some preemptive repair work if you do decide to use it as a camp knife, and test the edge and blade strength reasonably well before depending on it. At this price level, variations in quality of steel and temper are common. But just look at all you get! 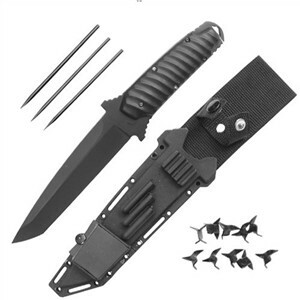 The knife set includes the main tanto, 10 caltrops, three shuriken throwing spikes, and a hidden punch dagger. The fitted belt sheath has places for all, and attaches to harnesses or other gear via the several holes and slots punched in its edges. How practical is any of this? Good enough that I'd certainly leave the caltrops at home. If you mistakenly dropped those on the trail when outward bound, you'd have a painful time getting back again. The throwing spikes? I will admit I take a set of those camping with me anyhow. The spikes are light, hard to damage, and let me get in some much-needed throwing practice in between supper and the mosquitoes without wrecking my good knife. Even if this set of ninja tools never leaves the wall of the den, it'll get a smile.